Feel free to add information or answer ?. I have been asked this so many times here and elsewhere I wanted to put together 1 post with all the relevant information that anyone here can add to. These are genuine and official download links. Its completely LEGAL to use them as they don't come with a product key. You'll need to use your own product key to activate Windows. The links provide an untouched Windows 7 ISO which is a fully functional 30-day trial version which can be converted into full version after entering your product key and activating it. Extract your iso to a folder on any drive like DVD. Inside \sources folder of that create $OEM$ folder and then add other folders as needed. To capture your actual product key you can use this simple vb script. This captures actual key and not the one on COA sticker. 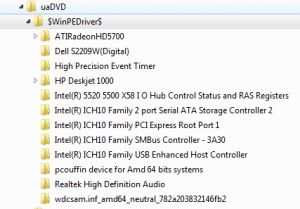 How to Choose Desired Windows 7 Edition / Version During Setup? Can use my Add Right click .wim Windows 7 for these operations. Only .inf drivers can be added to a Windows image by using this procedure. Drivers packaged as an .exe file or other file types must be installed on a running Windows operating system. 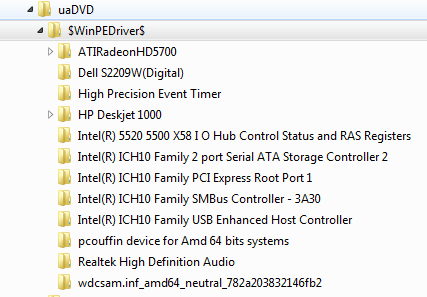 2011-08-08 10:13:03, Info                         PnPIBS: Checking for pre-configured driver directory D:\$WinPEDriver$. 2011-08-08 10:13:03, Info                         PnPIBS: Found pre-configured driver directory D:\$WinPEDriver$. 2011-08-08 10:13:03, Info                         PnPIBS: Added driver D:\$WinPEDriver$\Intel(R) ICH10 Family PCI Express Root Port 1\ichacore.inf to the list of drivers. We then mount and insert these files into the install.wim. Can use my right click .wim for these operations, it has an uninstall when you are done with it. You can simply install and enter product key to activate. And SIM keeps saying that the "key" must have a value. Should I ignore it and proceed anyway? I am getting the following error in virtual box. "Windows Setup could not install one or more boot-critical drivers. To install Windows, make sure that the drivers are valide, and restart the installation." This is when i do the $WinPEDriver$ thing. Nevermind, I think its bad driver files. I removed a folder and it got past that step. But now for some reason its refering to wim file thats not even associated with this install.going to start it over. I guess I need a way for it to not even look for a wim file. If you use an answer file during Windows installation, Windows Setup ignores the EI.cfg file. I also adapted your right click install.wim for my purposes, very handy addition. This is great when adding or replacing files. But what about removing files? I was thinking maybe adding bogus 0 byte hidden files to replace the files i want to delete from the image. When i mount the WIM and run the script to take ownership and force delete the said files then mostly it fails with "Access Denied". del /f /s /q "D:\7Work\WIM1\Windows\Help"
del /f /s /q "D:\7Work\WIM1\Windows\LiveKernelReports"
del /f /s /q "D:\7Work\WIM1\Windows\Media\*"
del /f /s /q "D:\7Work\WIM1\Windows\Resources\Ease of Access Themes\classic.theme"
del /f /s /q "D:\7Work\WIM1\Windows\Resources\Ease of Access Themes\hc1.theme"
del /f /s /q "D:\7Work\WIM1\Windows\Resources\Ease of Access Themes\hc2.theme"
del /f /s /q "D:\7Work\WIM1\Windows\Resources\Ease of Access Themes\hcblack.theme"
del /f /s /q "D:\7Work\WIM1\Windows\Resources\Ease of Access Themes\hcwhite.theme"
del /f /s /q "D:\7Work\WIM1\Windows\Resources\Themes\architecture.theme"
del /f /s /q "D:\7Work\WIM1\Windows\Resources\Themes\characters.theme"
del /f /s /q "D:\7Work\WIM1\Windows\Resources\Themes\landscapes.theme"
del /f /s /q "D:\7Work\WIM1\Windows\Resources\Themes\nature.theme"
del /f /s /q "D:\7Work\WIM1\Windows\Resources\Themes\scenes.theme"
del /f /s /q "D:\7Work\WIM1\Windows\Web"
del /f /s /q "D:\7Work\WIM1\Windows\HelpPane.exe"
del /f /s /q "D:\7Work\WIM1\Windows\SysWOW64\ssText3d.scr"
del /f /s /q "D:\7Work\WIM1\Windows\SysWOW64\Bubbles.scr"
del /f /s /q "D:\7Work\WIM1\Windows\SysWOW64\Mystify.scr"
del /f /s /q "D:\7Work\WIM1\Windows\SysWOW64\PhotoScreensaver.scr"
del /f /s /q "D:\7Work\WIM1\Windows\SysWOW64\Ribbons.scr"
del /f /s /q "D:\7Work\WIM1\Windows\System32\wdi\LogFiles\BootCKCL.etl"
del /f /s /q "D:\7Work\WIM1\Windows\System32\wdi\LogFiles\ShutdownCKCL.etl"
del /f /s /q "D:\7Work\WIM1\Windows\System32\ssText3d.scr"
del /f /s /q "D:\7Work\WIM1\Windows\System32\Bubbles.scr"
del /f /s /q "D:\7Work\WIM1\Windows\System32\Mystify.scr"
del /f /s /q "D:\7Work\WIM1\Windows\System32\PhotoScreensaver.scr"
del /f /s /q "D:\7Work\WIM1\Windows\System32\Ribbons.scr"
del /f /s /q "D:\7Work\WIM1\ProgramData\Microsoft\User Account Pictures\Default Pictures\*"
del /f /s /q "D:\7Work\WIM1\PerfLogs"
del /f /s /q "D:\7Work\WIM1\ProgramData\Microsoft\Windows Defender"
del /f /s /q "D:\7Work\WIM1\ProgramData\Microsoft\Windows\Ringtones"
del /f /s /q "D:\7Work\WIM1\Users\Administrator\Favorites\Links"
del /f /s /q "D:\7Work\WIM1\Users\Administrator\Favorites\Microsoft Websites"
del /f /s /q "D:\7Work\WIM1\Users\Administrator\Favorites\MSN Websites"
del /f /s /q "D:\7Work\WIM1\Users\Administrator\Favorites\Windows Live"
del /f /s /q "D:\7Work\WIM1\Users\Administrator\AppData\Local\Microsoft\Media Player\Sync Playlists\et-EE\00010C6E"
del /f /s /q "D:\7Work\WIM1\Users\Administrator\AppData\Local\Microsoft\Windows Mail"
del /f /s /q "D:\7Work\WIM1\Users\Administrator\AppData\Roaming\Microsoft\Internet Explorer\Quick Launch\User Pinned\TaskBar\Desktop.ini"
del /f /s /q "D:\7Work\WIM1\Program Files\Windows Defender"
del /f /s /q "D:\7Work\WIM1\Program Files\Windows Mail"
del /f /s /q "D:\7Work\WIM1\Program Files\Windows Media Player\wmpnetwk.exe"
del /f /s /q "D:\7Work\WIM1\Program Files\Windows Media Player\wmpnscfg.exe"
del /f /s /q "D:\7Work\WIM1\Program Files\Windows Media Player\Network Sharing"
del /f /s /q "D:\7Work\WIM1\Program Files\Windows Sidebar\Gadgets\*"
del /f /s /q "D:\7Work\WIM1\Program Files (x86)\Windows Defender"
del /f /s /q "D:\7Work\WIM1\Program Files (x86)\Windows Mail"
del /f /s /q "D:\7Work\WIM1\Program Files (x86)\Windows Sidebar\Gadgets\*"
Maxx, can you think of any explanation why $WinPEDriver$ method works in VM but not on real machine with exactly the same image used? Also, are you aware of any limitations of this, like for example total amount of files in the folder or size of any subfolders that might be there? Mine has worked on real install actual also. Just first test was VM. Perhaps look at setupact.log and see what happened? It did work for me as well, but it's acting up really weird at times. I also suspect it of not working well with Intel chipset drivers, but I'd need to test it a lot more. It could also be something completely else being fishy, because very often setup would show me the language and keyboard settings screen (it's not supposed to with automated installation) and freeze up at the very moment, and I have to reset the whole thing. Other times (much less often) I'd get weird error messages about no driver for the drive/controller/whatever I am installing from, and browse for files... option. There's definitely nothing wrong with my either PC or the flash drive I have. It also sometimes happened when I was still installing from a DVD. It's really annoying and I could never figure out the cause. Only select the ones in Red that are not MS.